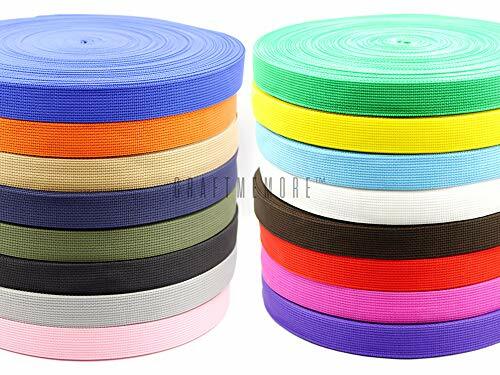 Versatile heavy nylon webbing is a woven flat strip of fabric that is used in countless applications; even as a substitute for ropes. Durable enough to be used in abrasive and delicate situations; it is a very functional webbing. Created from 100% pure nylon, its precision weave boasts incredible sturdiness. That means a breaking strength of 4,200 lbs, which can withstand your toughest projects. More rugged than polypropylene, nylon webbing is perfect for uses where safety is a concern. However, its texture makes it a good choice for light duty applications as well. Nylon webbing can be used in a wide variety of projects, including but not limited to: climbing harnesses, slings, runners, furniture manufacturing, military and survival utility, animal collars and leads, tie downs, belts, luggage, tow ropes, bags, and backpack straps. On top of all these features and applications, Country Brook Design offers the industry's largest selection of colors to choose from. We recommend you use 1 inch hardware with this nylon webbing; d-rings, buckle, triglides etc. These hardware items are designed with a specific size of webbing in mind. Please note that some rolls may contain factory splices. If you need a continuous roll without splices, please let us know. This webbing is washable and can be dried on low heat. Our nylon strapping is made from 100% pure nylon. It has a thickness of approximately .071 inches or 1.80 mm. 1 INCH WIDTH | We recommend you use 1 inch hardware with this nylon webbing. Great for reinforcing or fastening needs as well! DURABLE | The tensile strength is 4,200 pounds. Tensile strength is the average breaking point under good conditions at the factory, we suggest that you use no more that 50% of the tensile strength. VERSATILE | Functional and lightweight, but durable enough for all of your strapping needs! Please note that some rolls may contain factory splices. If you need a continuous roll without splices, please let us know. AMERICAN COMPANY | Made here in the USA, we take pride in our products and make sure you receive the best. 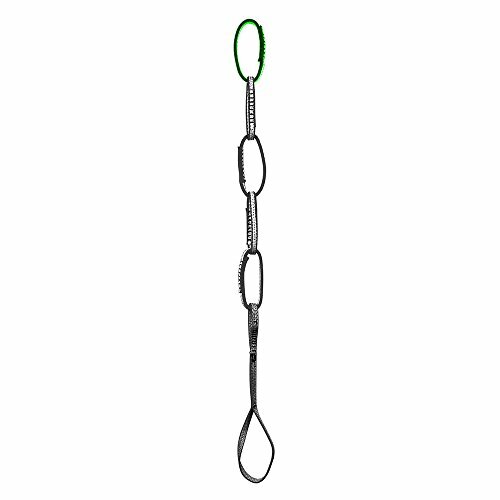 The Metolius Personal Anchor System is a new and vastly improved take on the daisy chain. This new design is significantly stronger than a classic daisy chain, and has fewer failure modes for added safety.Contrasting color on end loop simplifies use.11mm Dynema Monster Sling Webbing.CE/UIAA certified.Strength: 22kN (4950lbf).Weight: 3.3oz.Length: 38inches. 1/2 INCH WIDTH | Approximately .048 Inch or 1.20mm thick | Available in multiple yardages, ensuring you'll get the length you need. WATERPROOF | UV RESISTANT | MILDEW PROOF | Created from thermoplastic resins, it is ideal for outdoor applications. LIGHTWEIGHT | Versatile and lightweight, but durable enough for your light-duty applications! Please note that some rolls may contain factory splices. If you need a continuous roll without splices, please let us know. FUNCTIONAL | Soft to the touch, this polypro webbing is easy to work with and flexible. 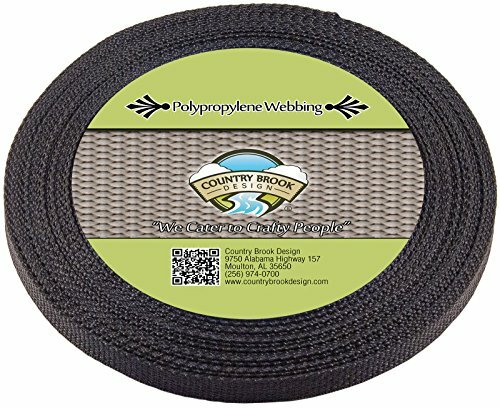 300 LB TENSILE STRENGTH | This polypropylene webbing has a tensile strength up to 300 lbs, but keep in mind that tensile strength is the average breaking point under good conditions at the factory. We recommend that you use no more than 50% of the tensile strength of any webbing. 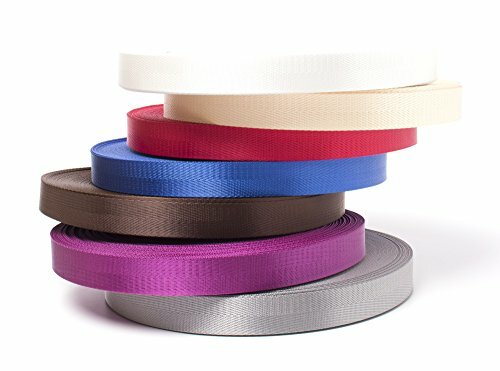 Climb-Spec 1" Tubular Webbing for making your own runners, quickdraws or harnesses, for anchoring or for use as a sling. Favored by climbers and rescue teams, this webbing out-performs normal mil-spec webbing in strength, flexibility, knot-ability and durability. Please note that tubular webbing is measured from edge to edge. That measurement does NOT refer to the inner dimension of the webbing. Lot Tested. Pick your size, color, and quantity! Great for pet collars, horse harnesses, tie-downs, leads, tow ropes, cargo strap and etc. See Seller Information >> CRAFTMEmore's Storefront on Amazon for more Craft Accessories!! 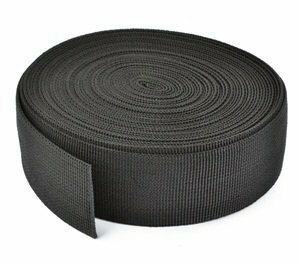 Our heavy nylon webbing is a woven flat strip of fabric that is used in many different applications. It can even replace the need of ropes. Versatile enough to be used in abrasive and delicate situations; it is a very functional webbing. Created from high strength nylon, it offers sturdiness from its woven design. Having a breaking strength of 1,000 lbs, this webbing can withstand your toughest projects. More rugged than polypropylene, nylon webbing is made of a hefty material and is perfect for uses where safety is a concern. Its texture makes it a good choice for light duty applications as well. Nylon webbing can be used in a wide variety of projects, including but not limited to: climbing harnesses, slings, runners, furniture manufacturing, military and survival utility, animal collars and leads, tie downs, belts, luggage, tow ropes, bags, and backpack straps. If your project requires more color choices, many are available from Country Brook Design. This webbing is washable and can be dried on low heat. We recommend you use 3/8 inch hardware with this nylon webbing; d-rings, buckle, triglides etc. These hardware items are designed with a specific size of webbing in mind. Please note that some rolls may contain factory splices. If you need a continuous roll without splices, please let us know. 3/8 INCH WIDTH | Our nylon strapping is made from heavy duty, quality materials. It has a thickness of approximately .046 inches or 1.18 mm. Versatile and lightweight, but durable enough for all of your strapping needs! Please note that some rolls may contain factory splices. If you need a continuous roll without splices, please let us know. These hardware items are designed with a specific size of webbing in mind. 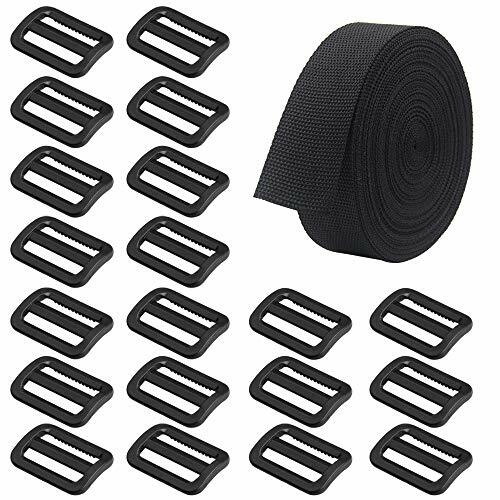 We recommend you use 3/8 inch hardware with this nylon webbing. Great for reinforcing or fastening needs as well! Made here in the USA, we take pride in our product and make sure you receive the best. 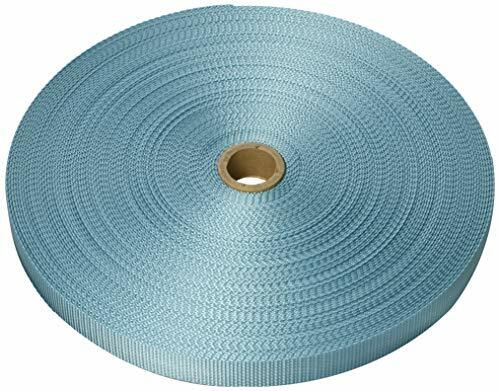 Versatile heavy nylon webbing is a woven flat strip of fabric that is used in countless applications; even as a substitute for ropes. Durable enough to be used in abrasive and delicate situations; it is a very functional webbing. Created from 100% pure nylon, its precision weave boasts incredible sturdiness.. That means a breaking strength of 1,250 lbs, which can withstand your toughest projects. More rugged than polypropylene, nylon webbing is perfect for uses where safety is a concern. However its texture makes it a good choice for light duty applications as well. Nylon webbing can be used in a wide variety of projects, including but not limited to: climbing harnesses, slings, runners, furniture manufacturing, military and survival utility, animal collars and leads, tie downs, belts, luggage, tow ropes, bags, and backpack straps. On top of all these features and applications, Country Brook Design offers the industry's largest selection of colors to choose from. We recommend you use 1 1/2 inch hardware with this nylon webbing; d-rings, buckle, triglides etc. These hardware items are designed with a specific size of webbing in mind. Please note that some rolls may contain factory splices. If you need a continuous roll without splices, please let us know. This webbing is washable and can be dried on low heat. 10 YARDS | Our nylon strapping is made from 100% pure nylon. It has a thickness of approximately 0.53 inches or 1.35mm. 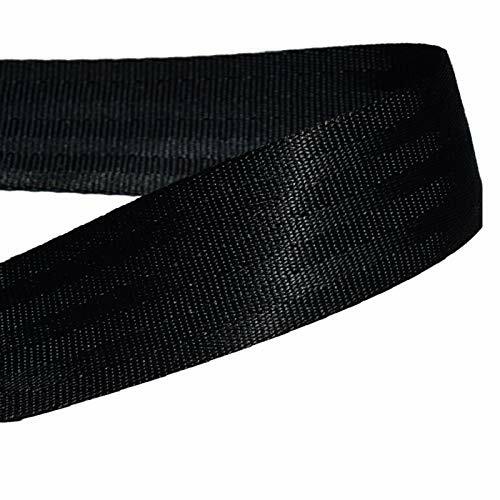 1 1/2 INCH WIDTH | We recommend you use 1 1/2 inch hardware with this nylon webbing. Great for reinforcing or fastening needs as well! DURABLE | The tensile strength is 1,250 pounds. Tensile strength is the average breaking point under good conditions at the factory, we suggest that you use no more that 50% of the tensile strength. 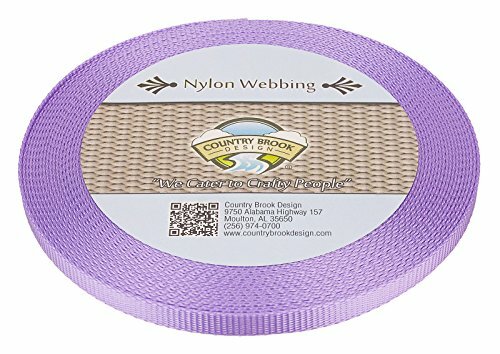 Take your craft project to the next level by using this heavy duty webbing. Create handcrafted belts, slides, cams, or ratchets. Use it to make a unique dog leash, guitar strap, replace a purse bag strap, or repair your lawn chair. 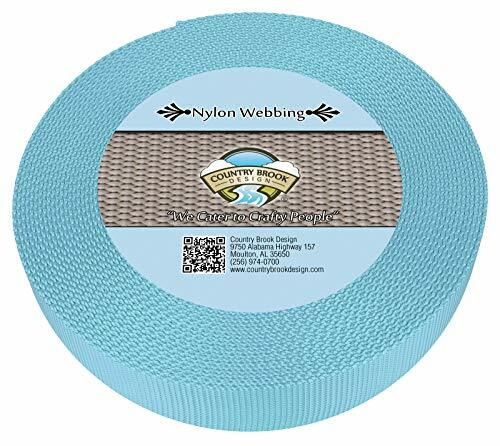 POLYPROPYLENE MATERIAL - Polypropylene webbing is made from thermoplastic resins and is a great choice for your outdoor webbing needs. A top choice for outdoor use, this versatile heavyweight webbing is a must-have when camping, boating, rafting and more. Polypro strapping is perfect for tie-down and cargo straps as well as an endless array of arts and crafts. EASY TO WORK WITH - The heavy duty webbing is easy to manipulate and sew. Create handcrafted belt, slides, cams, or ratchets. Use it to make a unique dog leash, guitar strap, replace a purse bag strap, or repair your lawn chair. PREMIUM MATERIAL- Our webbing is made of Polypropylene which is made from thermoplastic resins. Our triglide slides are made of high quality plastic, hard and not easy to damage. WIDE VARIETY OF USES- This strapping is water, won't stretch like nylon does. Suitable for outdoor use, this heavyweight webbing is a must-have when camping, boating, rafting and more. FUNCTIONAL NECESSITY TRIGLIDES- Triglides are frequently seen as adjusters on back pack straps. They are used to lengthen or shorten the strap to which it is attached. EASY TO USE- This flexible webbing is easy to manipulate and sew. Made with a tight weave, it's tough and aesthetically pleasing. 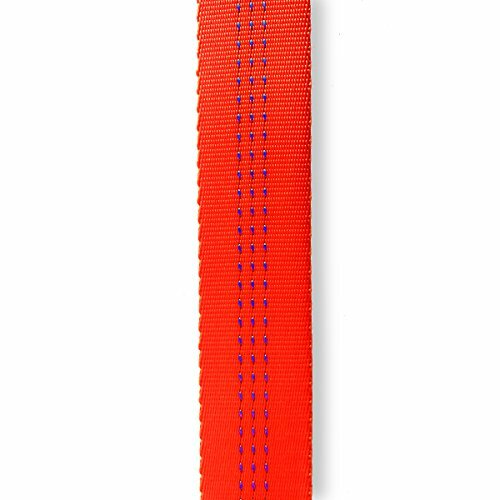 QUANTITY & SIZE- Our webbing is 1 Inch by 10 Yard and triglide slide is 1.6 Inch by 1.1 Inch. There are 1 piece Polypropylene Webbing and 20 pieces Triglide Slides in the package.